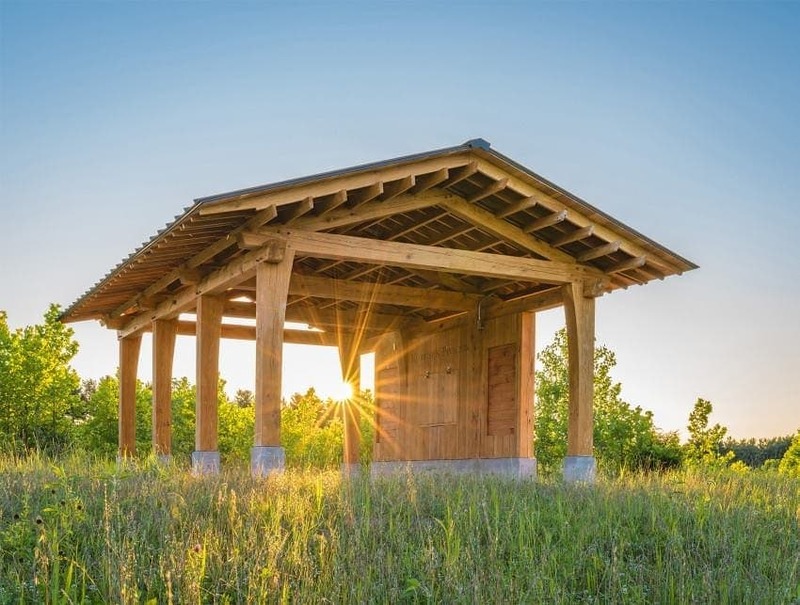 At Timber Frame HQ, it is our passion and goal to encourage you to live the good life in the strength and honest beauty of these sustainable structures. 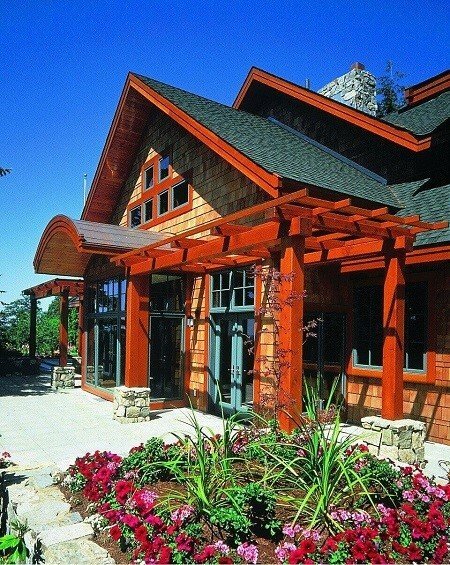 To give you inspiration, we are happy to bring you these magnificent frames that make you happy to be outside, from premier timber frame companies around the United States and Canada. Enjoy! 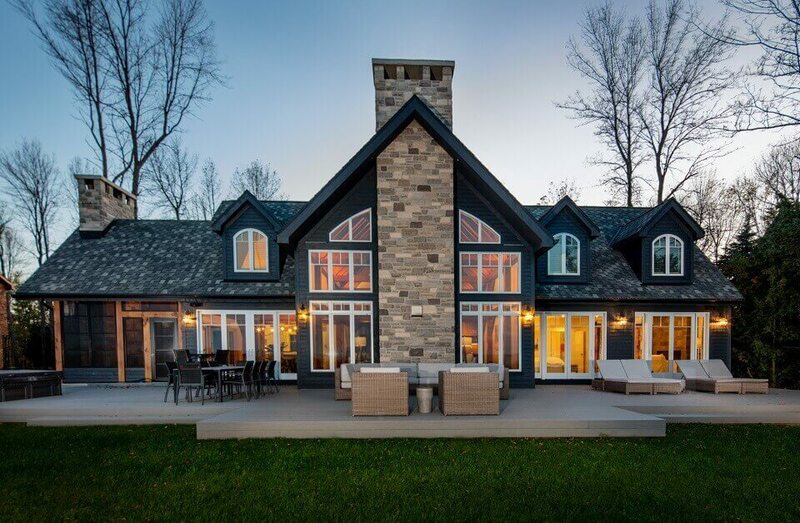 It doesn’t matter what the weather brings, you can revel in the great outdoors in this timber frame deck with hot tub, grill, electric stone fireplace and heat lamps. This slope-side hose at a ski resort in Maine was designed and built by Bensonwood, out of Walpole, New Hampshire. Photography is by James R. Salomon. Rustic live-edge tie beam and king post grace this welcoming front porch on a home in Montana. 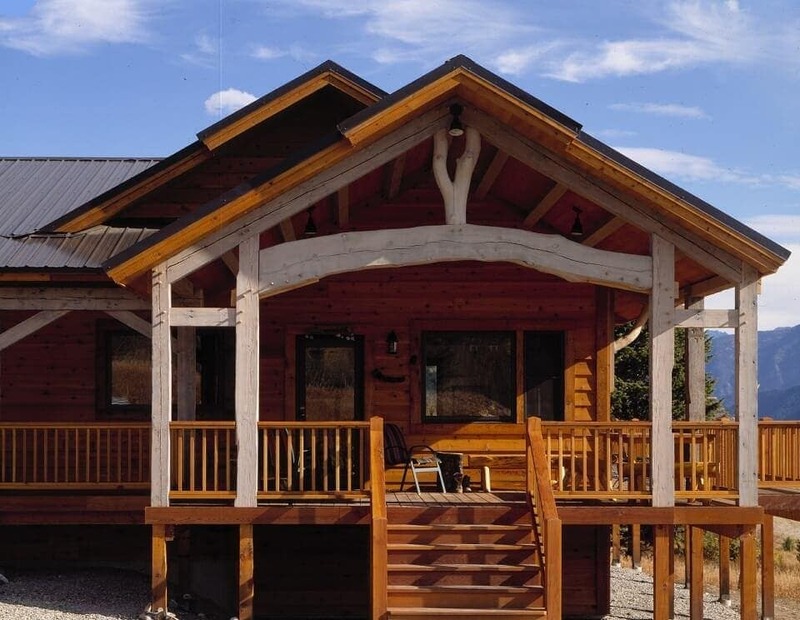 Enjoy the mountain air while you bask in the warmth of the gracious structure. - from Big Timberworks, out of Gallatin Gateway, Montana. 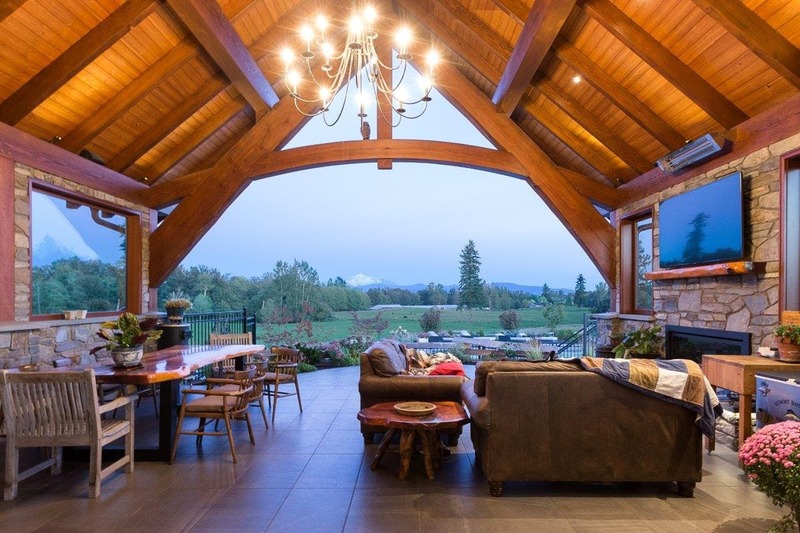 The out of doors is adorned by the artistic timbered architecture of this home. The rhythm of the arbors flank the eyebrow arched entry. What a place to greet your guests! . From Cascade Joinery , out of Ferndale, Washington. 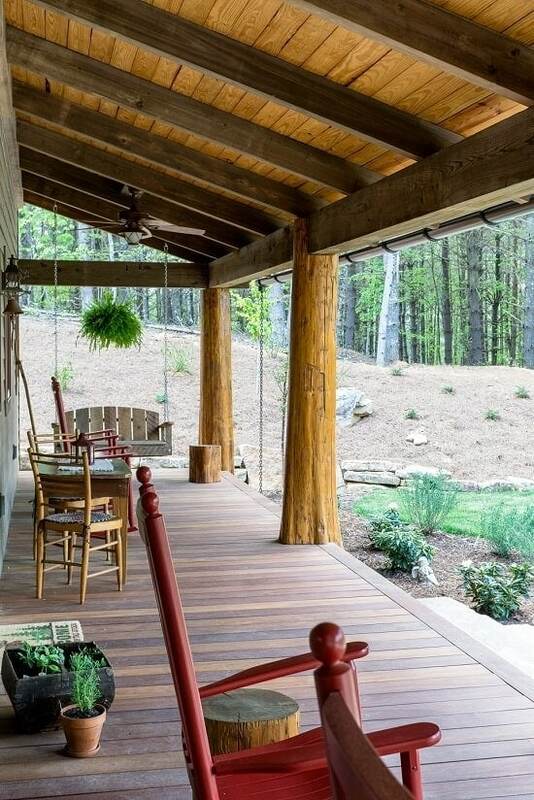 A good cup of coffee, a good chair… watching the world go by is a treat on this oversized porch with rustic timber and stone elements. 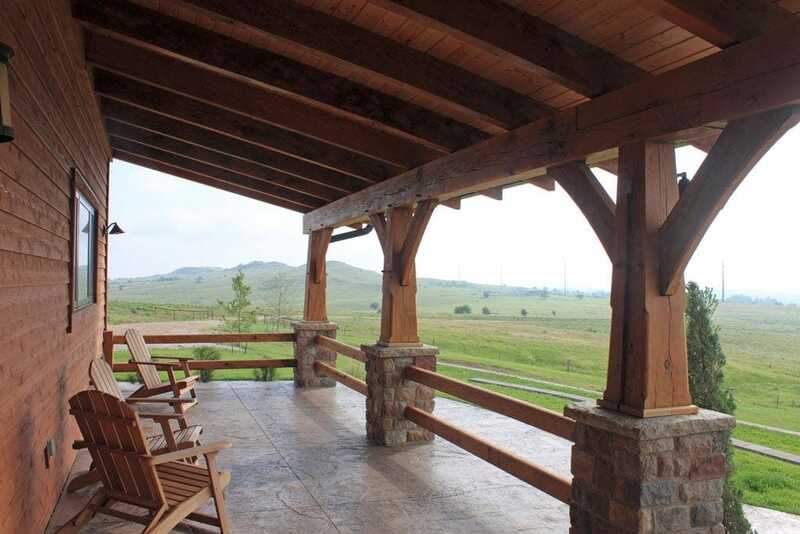 Savor the outdoors from the comfort of this ranch-style esplanade. From Clydesdale Frames, with offices in South Hutchinson, Kansas. 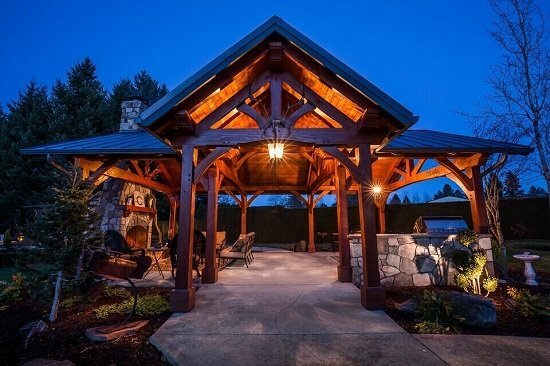 This stunning 18’x30’ pavilion in Boring, Oregon features handcrafted kingpost trusses. 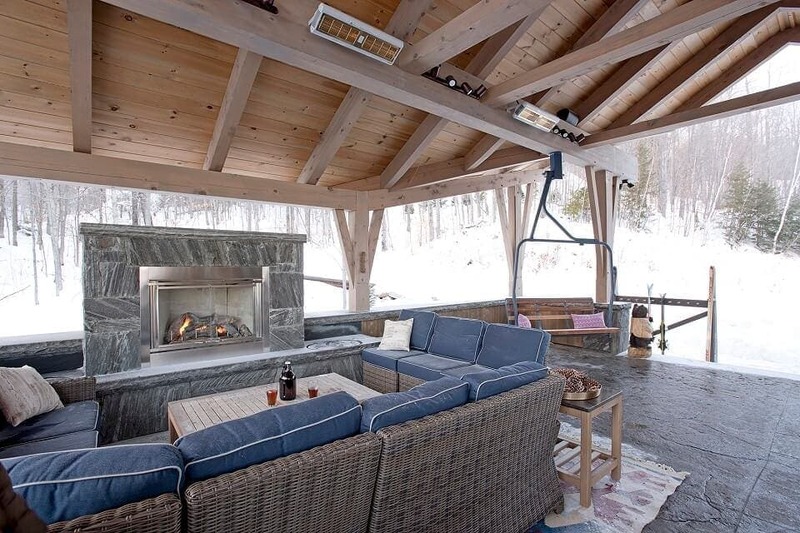 The versatile outdoor space includes a fireplace, skylights, outdoor kitchen and two seating areas. From Framework Plus, out of Gresham, Oregon . A soaring ceiling, massive hammer beam trusses and stonework on floor and fireplace set the stage for a perfect outdoor space. Bask in the sunshine on the adjacent terrace, or join the conversation grouping in the colorful Adirondack chairs. 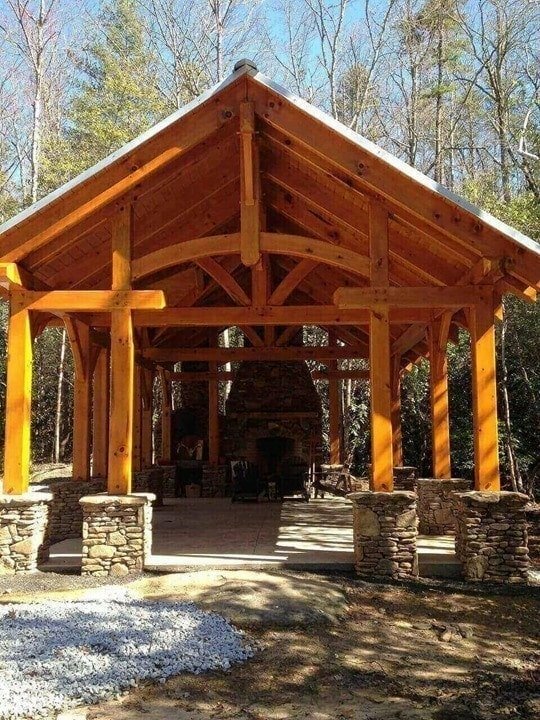 From Homestead Timber Frames, with offices in Crossville, Tennessee. 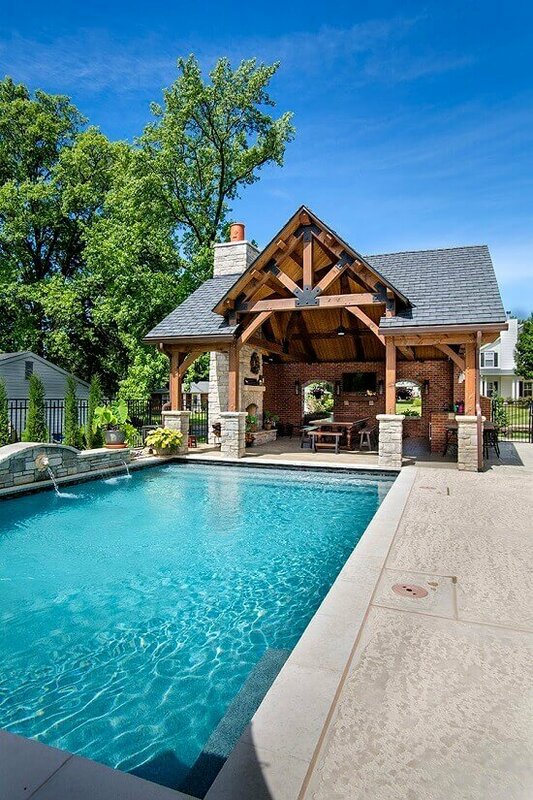 Enjoy the surrounding woods from the beauty of this secluded timber frame and stone pavilion. 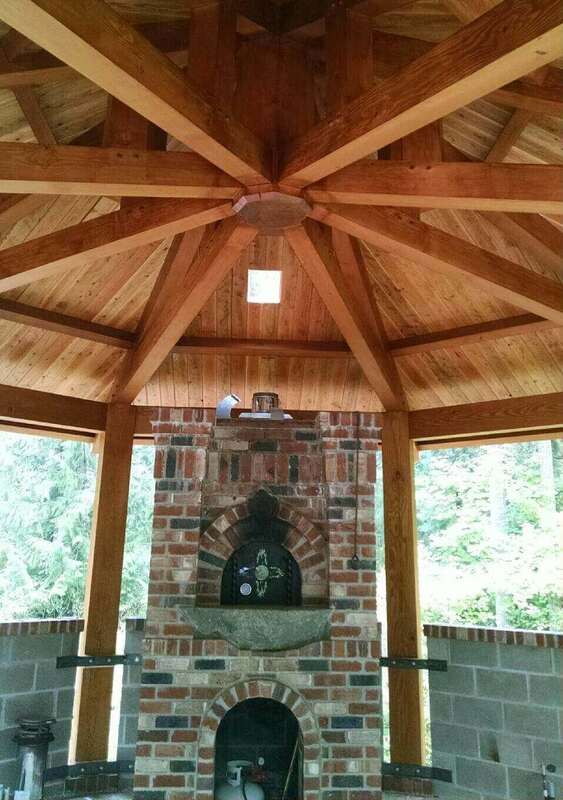 The graceful arched entry truss draws the eye to the stone pizza oven and fireplace. Stone piers add substance to the ample posts. 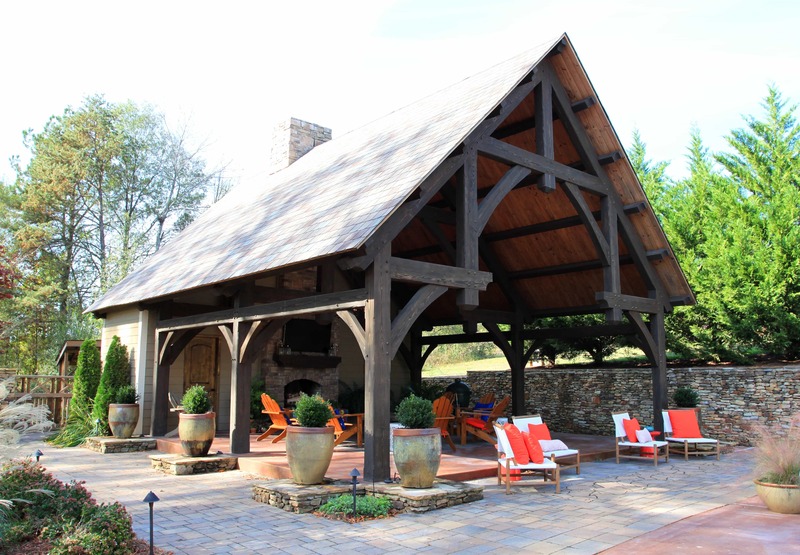 Built by Moresun Timber Frames, out of Long Creek, South Carolina. 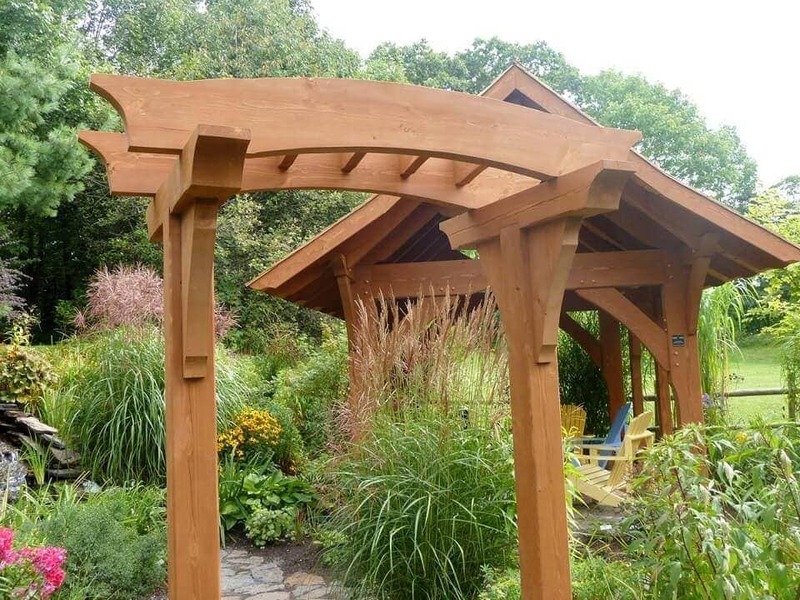 We would like to say a great big thank you to all of the talented timber frame companies who shared their beautiful projects with us, and with you! A lot of good work here. 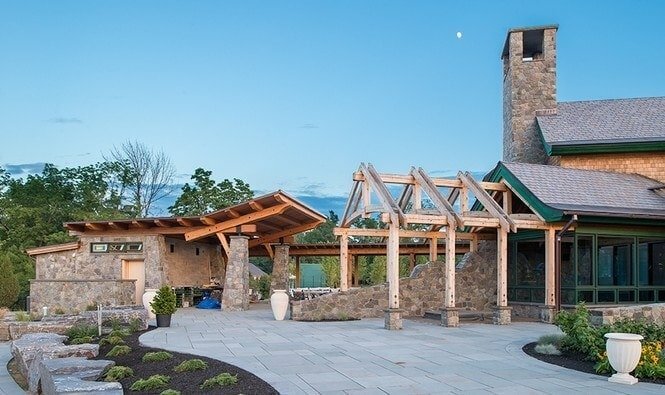 Timber framing has come a long, long way since the 1980’s. 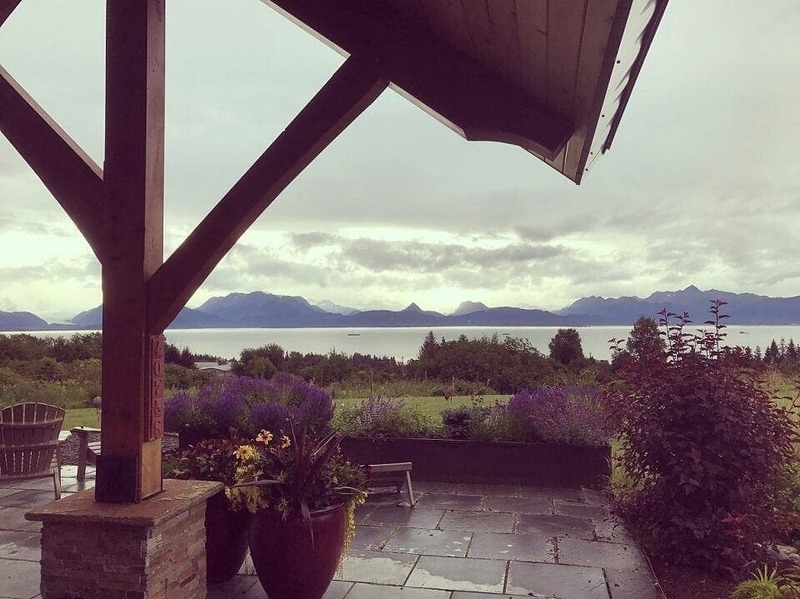 If we as a profession continue to learn how best to protect our outdoor timber frames from the elements the structures will outlive our client’s grandchildren. Thanks for the comment, Bruce! I’m sure your good work will last a very long time.